On a chilly day in late October, I found myself on the back of a horse slowly crisscrossing up a mountain and looking back at the breathtaking view of the pristine Lake Issyk-Kul stretching across the horizon. This is how I started my site visit to our location in Bishkek, Kyrgyzstan. Having worked with our partners for several years, and having already read reports from my colleagues’ previous trips, I was eager to make my first trip to Central Asia and meet them in person. In Bishkek, students can study Russian, Kyrgyz, Tajik, and Central Asian Studies at the London School. The school’s director and founder, Kendje Aitikeeva, works tirelessly to ensure the programs produce results for students through rigorous, relevant, and meticulously planned lessons. Language lessons are generally one-on-one or in very small groups, giving students maximum individualized attention at their level. Four days a week, students attend about 4-5 hours of class, each hour changing instructors and focusing on a different aspect of language (reading, writing, speaking, etc.). The lessons are topically related, using and logically building on similar vocabulary and grammatical structures throughout the week. Students access course materials via an online platform, which also delivers daily and weekly quizzes to reinforce their learning and evaluate their progress. This is all facilitated by young and energetic instructors who bring the material to life through interactive methodologies. Students rarely sit in their chairs for the duration of a lesson, they are up pairing vocabulary on sticky notes, underlining key phrases or grammar constructions or playing question/answer “toss and catch” at a gradually increasing speed, thus using physical movement to help their brain process and reinforce information. One day a week, students also attend informational talks about Central Asian history, culture, and modern society – depending on the student’s language level, these talks can be in English or the target language. During my time in Bishkek I was able to participate in a lecture/discussion about Russian interests in Central Asia, for instance. These weekly talks are critical for gaining an understanding of the region. Additionally, the instructors and the school organize hands-on opportunities for cultural immersion and language practice outside of the classroom. From cooking classes to handicrafts to singalongs and off-campus visits, students have excellent semi-structured exposure to culture and everyday language use. Another aspect of the program is peer tutoring. Once or twice a week, students from a local university meet with the students for an hour or two of conversation and exploration of the city. This time might range from simply chatting over coffee to haggling over goods at one of the local markets. The school staff is committed to student success. Students are regularly asked for feedback and encouraged to report any concerns. The School is quick to respond and work with SRAS to resolve any issues and accommodate student interests. In addition to the director, there are two individuals, an academic coordinator and a cultural coordinator responsible for overall SRAS programming. I was impressed by the strength of the academic program provided by our partners at the London School and the SRAS students there when I visited echoed my sentiments. Both SRAS Challenge Grants and Home and Abroad Scholarships are also available in Bishkek, making this location even more accessible and affordable. The London School is located in a central and easily accessible area of Bishkek in a small three-story building with about 21 classrooms. There is a small café on-site so students can grab coffee, tea, or a very affordable bite to eat between classes and practice their language skills with the very friendly staff there. Across the street, there is a Traveler’s Coffee offering a wider menu for a coffee break or lunch. There are also other small cafes and a grocery store nearby. At the school, a constant flow of locals – schoolchildren and adults – attend English classes at the school, so the hallways are full of constant coming and going, with chatter in multiple languages, thus creating an energetic and welcoming atmosphere. The school has on-site housing in the same building where classes are held. Students live in suites where two sizable two-person rooms share a bathroom and small kitchen. One of our students had a whole suite to herself in the fall semester, whereas in the summer, the rooms are usually filled and additional dorm-type housing is made available at a different location about a 20-minute walk from campus. Just five minutes from campus is a gym that many students join during their time in Bishkek. 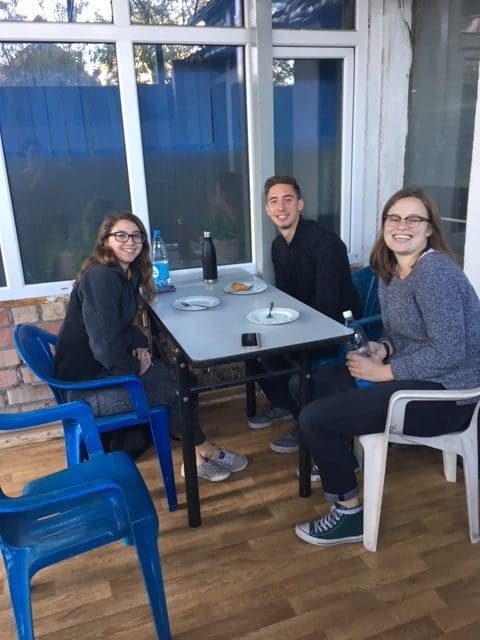 Although the dorms are generally comfortable, the majority of SRAS students in Bishkek live in homestays to take advantage of yet another excellent opportunity for language practice and exposure to the local culture. All of the students I met who were in homestays absolutely loved their hosts and experience. The school provides both the hosts and students with extensive cultural information to help promote an environment of mutual understanding in the living situation. My short daytrip to Issyk-Kul for a mountain trek and a visit to a small, traditional village gave me the opportunity to get a glimpse of what SRAS students have to look forward to in their included cultural programs (listed on each program page) – authentic experiences with the local culture and surrounding nature. Students have the possibility for a longer trek, more village visits and visits to other valleys, mountain ranges and hiking trips. The mountains and nomadic lifestyle in Kyrgyzstan may have resulted in less than spectacular urban spaces, but the surrounding valleys, majestic mountains and modest, welcoming people give one a different type of experience. Students will also find getting out on their own to be quite easy. It is simple and affordable to get around Bishkek via public transport or taxis. Near the school, there are several areas and main streets to explore that are also very walkable. Bishkek is a great place for practicing your target language as English is not widespread. While the streets may not be overflowing with obvious things to entertain you, one simply needs to have an open mind, do a bit research and talk to locals – or just get out and explore. I jumped on a crowded bus with a student and enjoyed a visit to the largest bazaar in Bishkek, the Osh bazaar, where I was pleasantly surprised that the sellers were not particularly aggressive. This is a place one could visit once a week and have a different experience each time while getting some practical shopping done at very reasonable prices. Bishkek still has several Soviet holdovers that are fun to explore like the central movie theater, post office, carbonated flavored water dispensaries, and a roller-skating rink are just a few I stumbled across in my short time there. One student shared with me three things that she discovered and got involved in over her 15 short weeks: volunteering with the elderly, the Trekking Union of Kyrgyzstan, and Kangoo jumping exercise classes. Bishkek has no shortage of non-governmental organizations, many focusing on democracy-building, gender equality and rural development. These organizations are generally open to volunteers and potentially can offer internship opportunities allowing students to gain insight from and make contributions to real development projects. 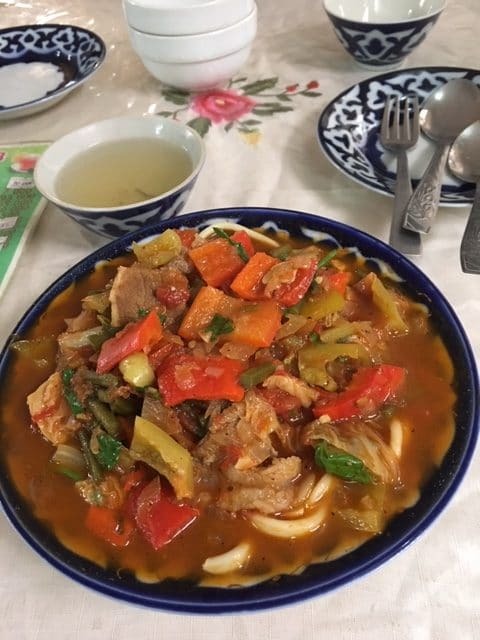 I was pleased to find a range of restaurants and cafes both local and other ethnic flavors. I enjoyed Georgian, Indian, and delicious local dishes, as well. Kyrgyz food is rather heavy, understandably, as a traditional nomadic lifestyle demands sustenance. However, thanks to an abundance of fresh fruits and vegetables, it’s possible to eat a bit lighter, as well. A growing area of the city is filling up with trendy new bars and restaurants, but generally Bishkek is a very affordable place to live on a US student budget. 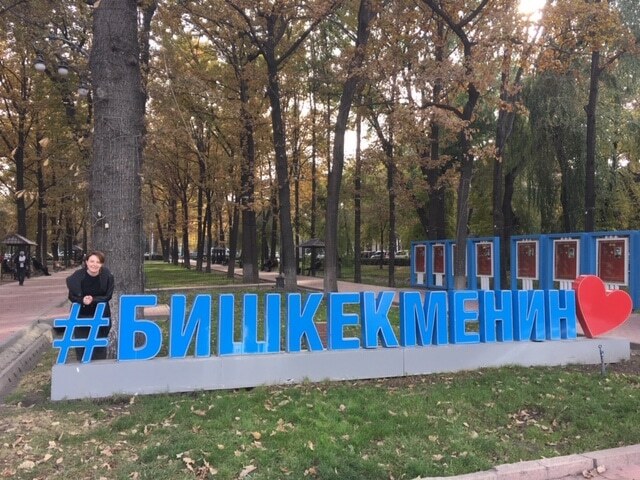 The author near a sign that says “I love Bishkek”. It can be found on Erkindik Avenue, a very central street with a long tree-lined pedestrian walkway running down the middle. 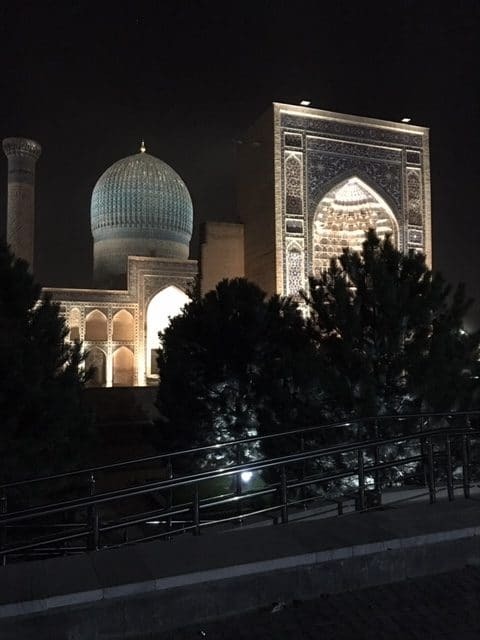 Students on the Central Asian Studies program travel to several countries in Central Asia as part of their program (often to Kazakhstan, Uzbekistan, Tajikistan and/or Turkmenistan). Students will generally find travel quite affordable if they would like to do it on their own as well. The simplest and cheapest trip is to Almaty, Kazakhstan, just on the other side of the mountains and a short bus or plane trip. Although I didn’t make this trip several students had, some even more than once. However, I did take the opportunity to travel to Uzbekistan via a one-hour flight. In the past few years, under new leadership, Uzbekistan has begun to open up. Getting into the country and traveling to a few cities was relatively easy. Americans need a tourist visa, but one can easily be obtained online, or even right at the airport on arrival. I spent a day in Tashkent, an impressive city with monuments, boulevards, metro stations, parks, and bazaars all on a grand scale. What struck me most was the cleanliness and modernity of the city. I would definitely go back and spend more time exploring and getting a better feel for the city’s character. I took the very convenient and affordable high-speed train from Tashkent to the ancient cities of Samarkand and Bukhara. It was in these cities, surrounded by the ancient domes, minarets and madrassas that I felt a sense of being whisked back in time and into the legends of the Silk Road and ancient civilizations of the region. In Bukhara, I had a guide who took me through the narrow back alleys of the city to see original homes and some of the more than 200 mosques or madrassas still waiting to be studied and restored. 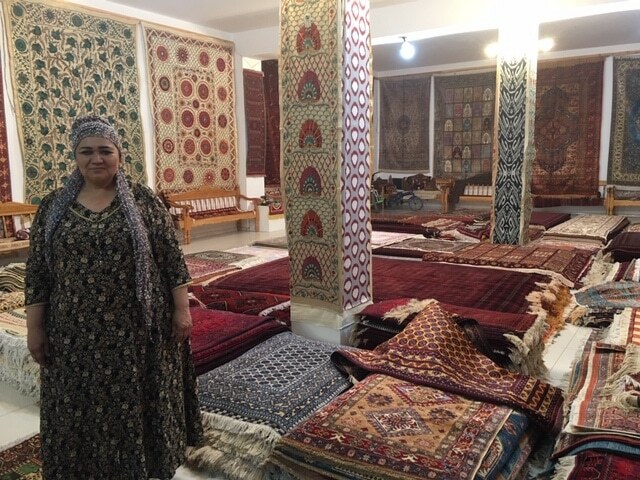 I could have walked for days in the footsteps of caravans and merchants examining all of the beautiful handmade scarves, rugs, jewelry, and pottery and learning the stories safeguarded in the ancient stone walls. Luckily, I’m a fan of bargaining – a required activity among the Uzbek people where traditions of commerce run deep. I would strongly recommend a trip to Uzbekistan for anyone studying in Bishkek. Bishkek is a great study location for the curious and serious student. The London School provides a stellar academic program and Central Asia is a fascinating, complex region offering much in the way of discovery. 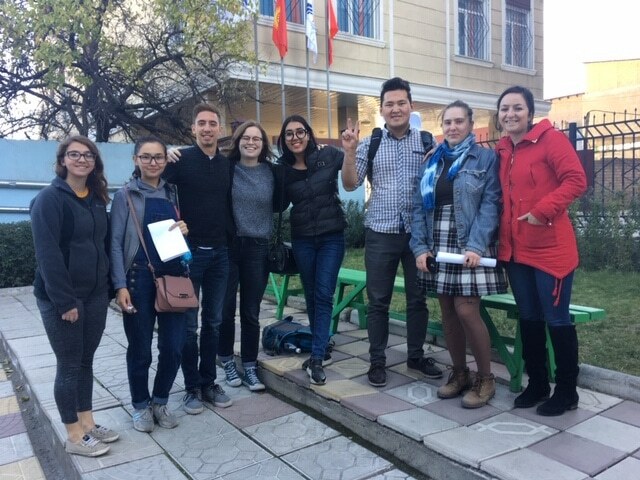 A semester, summer, or year in Bishkek is potentially one of the most unique study abroad opportunities available to students interested in this greater region of the world. Visit SRASstudents.org to read what our students have shared about their experiences there. To learn more about the region itself, visit GeoHistory, part of the SRAS Family of Sites. At Stetson, we’ve used SRAS to arrange all of our student study abroad trips for the past five or six years. During that time we’ve sent dozens of students on summer- and semester-long programs in Moscow, St Petersburg, Nizhny Novgorod and Irkutsk. In every interaction I’ve had with them, SRAS has been prompt, reliable, knowledgable, courteous and quick to lend a hand when needed. At a time in my life when I was at a crossroads regarding where my career might take me, this course showed me a path that truly inspired me, and I haven’t looked back since.